See how the magic of Disney brings the love of couples and families together in this delightful collection of stories of courtships, anniversaries, engagements and weddings. If you believe in the magic, you will love these touching and playful stories of the heart. See how couples find love through Disney from afar. Relive a moving engagement on Test track, magical moments by the castle, an endearing library proposal, and a stop at the train station that will have you cheering these couples on as they declare their love for each other. Belle, the Beast, Donald Duck, Mickey and Minnie, and even Kylo Ren, Boba Fett and the Stormtroopers join in the fun to the delight of wedding guests. Sweet anniversaries of new love and those that have stood the test of time will warm your heart. Poignant moments will make your heart skip a beat. Add Cinderella carriage rides, the Cruise ship, a princess reunion, the Haunted Mansion, and a pranked best man saved by Major Domo to the endless list of magic and fun in the name of love. 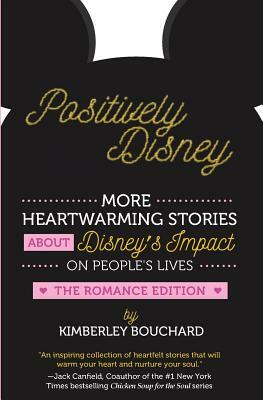 All of these and more await you in the third installment of the Positively Disney Book series. Kimberley Bouchard is a best-selling author, educator, podcaster and speaker. She grew up watching the Wonderful World of Disney on television on Sunday nights. She has visited Disneyland, Disneyland Paris, cruised with Disney and is a frequent visitor to Walt Disney World. She loves all things Disney and unabashedly admits that Donald Duck is her guy. Originally from Canada, she now resides in the Seattle area with her husband, their three children and various critters.